At Running Excels, we take pride in our community and want to help as much as we can. We partner with a variety of charitable organizations to support their work. Are old running shoes taking up space in your closet? Donate them to Share Your Soles! 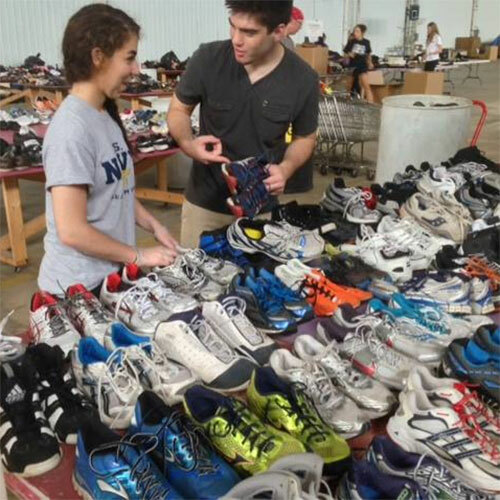 Share Your Soles is a non-political, non-religious organization that donates used running shoes to deeply impoverished nations. Each pair of shoes donated is cleaned, polished, and distributed to the people of these nations, some of which have never owned shoes before. Drop off your used running shoes in the Share Your Soles drop box at Running Excels in Beverly. We have partnered with Running for Hope, a 5K that raises funds for Advocate Children’s Hospital in Oak Lawn and the Ronald McDonald House® near the hospital. Running Excels also supports the Lower Wacker Mission by gathering food items and packing lunches for 180 homeless men and women who sleep under Wacker Drive.